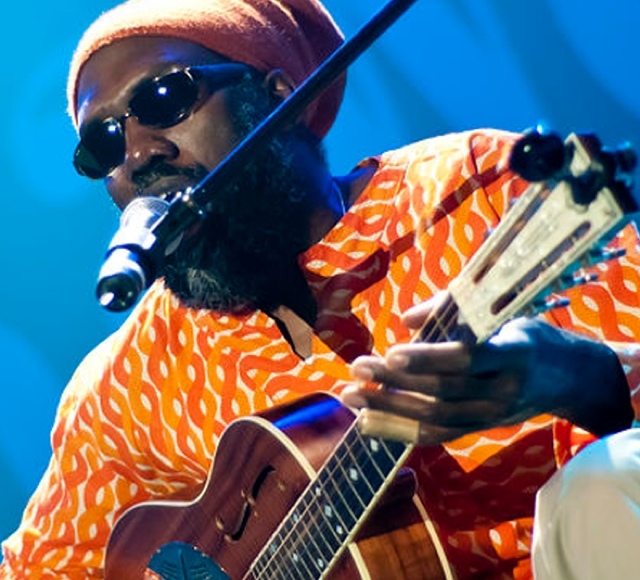 Corey Harris began his career as a New Orleans street singer, travelling throughout the southern U.S. In his early twenties he lived in Cameroon, West Africa for a year, which had a profound effect on his later work. He has recorded many old songs of the blues tradition while also creating an original vision of the blues by adding influences from reggae, soul, rock and West African music. His 1995 recording, Between Midnight and Day, is a tribute to the tradition of acoustic blues. Subsequent recordings, such as Greens From the Garden (1999), Mississippi to Mali (2003), and Daily Bread (2005) show Harris’ maturation from interpreter to songwriter. Some of his imaginative compositions are marked by a deliberate eclecticism; other works stay true to the traditional blues formula of compelling vocals and down-home guitar. With one foot in tradition and the other in contemporary experimentation, Harris is a truly unique voice in contemporary music. He has performed, recorded, and toured with many of the top names in music such as BB King, Taj Mahal, Buddy Guy, Henry Butler, R.L.Burnside, John Jackson, Ali Farka Toure, Dave Mattews Band, Tracy Chapman, Olu Dara, Wilco, Natalie Merchant, and others. His additional recordings include Fish Ain’t Bitin’ (1996), Vu-Du Menz (with Henry Butler, 2000), Downhome Sophisticate (2002), and Zion Crossroads (2007).blu black ( 2010 ). In 2003 Harris was a featured artist and narrator of the Martin Scorcese film, “Feel Like Going Home,” which traced the evolution of blues from West Africa to the southern U.S. In 2007, he was awarded a $500,000 MacArthur Fellowship – commonly referred to as a “genius award” – from the John D. and Catherine T. MacArthur Foundation. The annual grant, which recognizes individuals from a wide range of disciplines who show creativity, originality and commitment to continued innovative work, described Harris as an artist who “forges an adventurous path marked by deliberate eclecticism.” That same year, he was also awarded an honorary Doctor of Music degree from Bates College, in Lewiston, Maine.